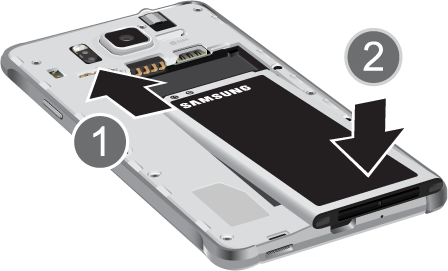 How do I install or remove the battery and battery cover for my Samsung Galaxy Alpha? You must fully charge the battery before using your device for the first time. A discharged battery can fully recharge in about four hours. Your device is powered by a rechargeable Li-ion battery. The wall charger used to charge the battery is included with your device. Use only batteries and chargers approved by Samsung. NOTE: Make sure the battery is properly installed before turning on the device. 1. 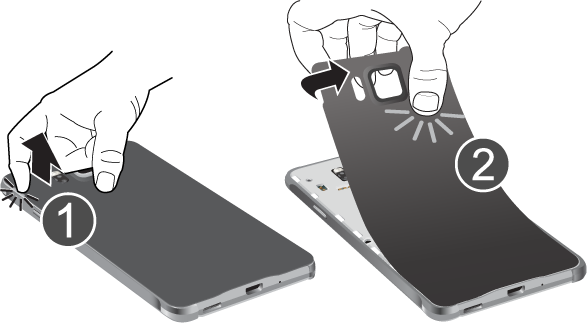 Gently pull the cover off your device, using the slot on the side (1), and then lift the cover up and away from the device (2). 3. Replace the back cover. 4. Press along the edge of the back cover until you have a secure seal and it clicks into place. 5. 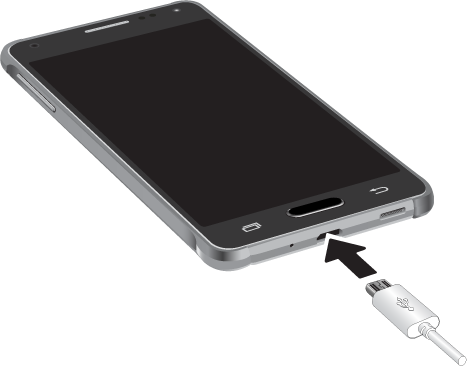 Plug the USB connector into the power/accessory interface connector on the bottom of your device. 6. Plug the wall charger into an electrical outlet. It may be necessary to connect the USB cable to the charging head before you can plug it into an electrical outlet. Fully charging a battery may take up to four hours. Galaxy Alpha: How do I configure the Power saving mode on my Samsung Galaxy Alpha? Galaxy Alpha: How do I set up and use speed dials on my Samsung Galaxy Alpha?